WOODSIDE — For Moriah Young Graham, flying a plane is much easier than driving a car. “I fly a lot better than I drive because I’ve been doing it for so long,” she said last week. While most teens work on getting their driver’s license in high school, Ms. Graham was piloting a plane. She made history in May when she became the first African American on record in the state to earn a private pilot’s license in high school, according to her instructor, retired Lt. Col. Raymond Ott. Ms. Graham, who graduated from Polytech High School this month, said that although she’d wanted to pilot a plane for years, “I didn’t realize I would love it as much as I did.” For Moriah, soaring above the clouds is peaceful. “You never realize how cluttered it is on the ground,” she said. Earning a private pilot’s license is an option for students studying aerospace science at Polytech. This year, five students — a school record — received their license. Typically, Lt. Col. Ott said, only one or two students a year finish the requirements. For ground school and flight training, Ms. Graham needed to commit to flying each week, give up evenings for meetings and maintain high grades. “I think any time someone does something that people want to label or mark as not being what you should do in life that it shows grit, determination and focus,” Lt. Col. Ott said. “It’s definitely one of the hardest things I’ve ever done,” Ms. Graham said. Being on your own in a plane is terrifying at first. “My first solo flight was in August. I think that’s the most scared I’ve ever been,” Ms. Graham said. That first flight, she only flew about 800 feet and then came back down. Now, of course, she’s flown all around the East Coast. 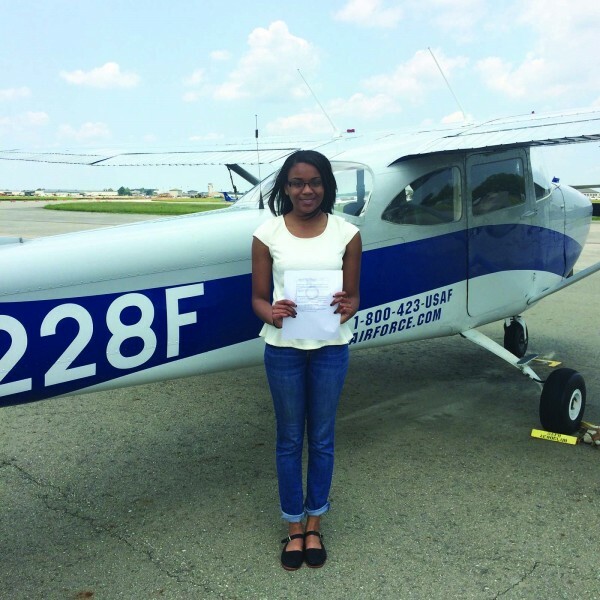 When she was ready to earn her license, Ms. Graham needed to take an expensive, hours-long exam and head out on a checkride with her instructor. “It’s an all-day experience and it’s the most stressful day of my life,” she said. When she was a little girl, Ms. Graham said that she was fascinated by space and she wanted to become an astronaut. From the time she learned about Polytech’s Air Force JROTC program in seventh grade, she knew she wanted to go there. Throughout the program, she was motivated knowing that she was breaking down barriers. “I want to continue flying because there aren’t a lot of girls in the aviation world, specifically black girls,” she said. Ms. Graham said that she plans to attend Embry–Riddle Aeronautical University in the fall.